We’re wrapping up a new website we built for Michelle Loma @ Decor On A Dime. The new site design just went live this weekend. 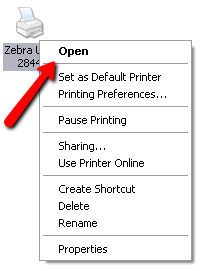 One of the first troubleshooting steps when working with a Zebra tag printer, is performing what’s referred to as a Memory Dump. For all intents and purposes, you’re re-calibrating the printer. 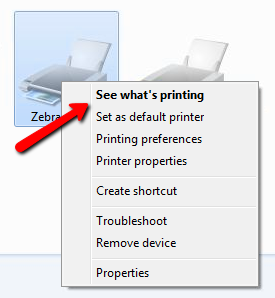 If you’ve just printed using a new tag format, the Zebra tag printer might skip tags and “fault”/go to a red light. If tags were printing just fine a second ago and nothing has changed other than the tag format you select within your consignment software or the roll of tags in the printer itself, then the first thing we recommend is a Memory Dump. The following is a video that demonstrates how to perform a Memory Dump. This video utilizes a Zebra LP2824 tag printer. The steps are identical for the the Zebra LP2844. 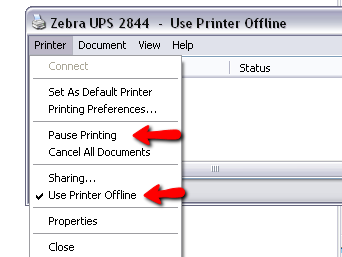 Notice how Use Printer Offline is checked and shows the same status in the title bar? The Computer Peeps have prepared step-by-step Memory Dump instructions you can print out and keep near each of your tag printers. Click the PDF icon below to download and print your own copy of the Memory Dump instructions! This is a quick rundown of each of the consignment software vendors in the industry. The aim of this article is to provide a concise list of the software programs available and what each vendor charges for software and support. We strive to ensure each detail is accurate and current. If you are a software vendor and find any of the information regarding your product or service to be inaccurate, please let us know. We’ll correct it immediately! About: Founded in 1996. Owned and operated by Brian Wilson. Technical Notes: The software runs on Windows (32-bit or 64-bit) and has a Microsoft Access database type. Features: “Home page” (Main Menu) feature with all tasks on one screen. Consignment and Buy Outright capabilities. Web and email features (including consignor logins). Typically referred to as the “easiest to use consignment software” on the market. Support: Support is free for one year with any new license purchase. After that, support is $150 per year for 1 or 2 computer setups and only slightly more for 3+ computer setups. Free updates with Support Plan. About: Resaleworld has been manufacturing consignment software for nearly 20 years. Technical Notes: The software runs on Windows and has a Microsoft SQL Server database type. Features: Inventory module and separate Point of Sale module. Web and email features (including consignor logins and online appointment scheduling). Consignment and Buy Outright capabilities. Very comfortable Point of Sale. Support: 30 days of free support, 1 year of support is $179.40 for a single-user license. Free updates with support plan. Consignment Software: Consignment Ease formerly Best Consignment Software ($395), Consignment Success ($995) *No longer in development. About: Started by Bill Hawkins in the late 90s. Sold to Tammy Ruddick and her husband, Kelly Ruddick, in 2009. Sold again in 2012 and currently owned and operated by Tri-Tech. Technical Notes: The software runs on Windows (32-bit or 64-bit) and has a dBase database type. Features: Consignment and Buy Outright capabilities. Web and email features (including consignor logins). Very streamlined, easy to use interface. Support: 60 days of free support, 1 year of support is $9.95 per month per store. Free updates with support plan. Additional Info: Make sure you don’t confuse Best Consignment Software and Best Consignment Shop Software. For information on Best Consignment Shop Software, please read the following review. Background: Owned and operated by Ron Funnell. Technical Notes: The software runs on Windows (32-bit or 64-bit) and is only one of two consignment programs to utilize MS SQL Server. Features: Design custom price tags/labels. Consignment and Buy Outright capabilities. Install Consignment Till on up to unlimited computers, in the same location, at no extra charge. Very user-friendly interface. Background: Manufacturing consignment software since 1999. Technical Notes: The software runs on Windows and has a Microsoft Access database type. Features: Very simple, easy to follow interface. Consignment and Buy Outright capabilities. Support: 30 days of free support, 1 year of support is $150 for a single workstation configuration. Free updates with support plan. Background: Relatively new on the consignment software vendor scene. Company seems focused on developing good software and providing customer service. Technical Notes: The software is web-based, which means an Internet connection is required in order to use it. Support: 15 day Free Trial, Free Customer Support. Background: Specialize in Buy Outright software. Family owned and operated. Technical Notes: The software runs on Windows and has a Clarion database type. Features: Tailored to Buy Outright stores. Support: 30 days of free support, 1 year of support is $150 for a single-user license. Free updates with support plan. Again, we will constantly check for changes to the specs/prices above. If you have any questions about the information above, please call The Computer Peeps @ (888) 374-5422. What would you do if your computer wouldn’t power on? What would happen if the consignment software you use to manage your business, was inaccessible? Have you prepared for this event? It’s one thing to go through each day, accustomed to things just working. It’s a completely different situation when you go to power on your computer and … blank screen. Or, you go to launch that one program – you know, the one that runs your business, keeps track of all your consignors and customers, etc. – and all of a sudden, the dreaded ERROR message appears. Hardware and software can and will fail. It’s not a matter of if, it’s a matter of when. You spend day after day adding new consignors, entering-in new inventory, ringing up sales…this is your livelihood! If your systems go down, you should be prepared. The last thing you want is for panic to ensue. If you have only one computer at your store, think about how you would cope if that computer wouldn’t power on one morning. Do you have the ability to process sales manually? Are you going to turn away customers if you can’t get into your system or process credit cards? Make sure you have a game plan ready so you can keep your doors open and keep customers happy! If you have more than one computer in your store, what would happen if the primary computer (typically referred to as the ‘server’) were to fail? Have you practiced swapping out one of the other systems as a temporary replacement? Make sure you or the person that takes care of your computers are well-versed in installing the software you use, restoring your data, configuring printers, etc. The crux to disaster recovery is having a legitimate backup. Why didn’t I just say “backup”? Just because you click a button at the end of each day, doesn’t mean your backup is viable. All backups – regardless of the system in question – should be tested on a regular basis. So how does one test a backup? It has to be restored. You don’t want to do this on the system at your store though; not on a live system. Instead, do so on a computer at home or on a separate test system. Having your consignment software installed at home allows you to be prepared for a disaster. If you have the same software at home, that computer could potentially serve as a backup/temporary replacement computer. If you take your backups home with you and test them once a week, you’re killing two birds with one stone! What about tag and receipt printers? We all know how important tag printing is. Are you prepared to move your printer to a new computer? It has to be installed, configured, etc. Some guffaw at all of this, but it’s a much different story when disaster strikes. Ask yourself, “what is my time worth to me?” If you’re into surprises and enjoy chaos, just forget about everything I’ve typed above. If you know you can’t imagine being without access to your consignor information for two or more days, it’s time to prepare. 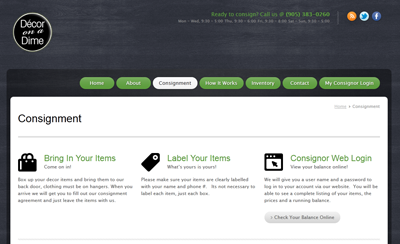 Install your consignment software at home. It’s good practice and your home computer could potentially serve as a replacement system in a pinch. Check with your software vendor for licensing terms. Restore your backup once a week. This ensures your backups are viable. 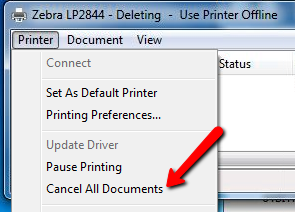 Make sure you know how to get all of your printers up and running, quickly. Make sure you have the ability to process payments, should your systems go down. Whatever happened to those old, loud card imprint machines? Just like having a good car mechanic, it’s very important to have a knowledgeable computer technician you can trust. If you don’t already have a computer technician, it’s worth asking other consignment shops in your area. Or, utilize the r/consign Sharing Forum where you can post questions and other store owners can provide feedback.